This amazing 2018 1 oz Niue Silver $2 Disney Year of the Dog PCGS MS 69 FS is a unique release from the New Zealand Mint. Niue has made his name on the precious metals market with exclusive bullion coin programs, and Disney Coin Series is yet another fantastic program started by this island nation. The program was released in 2014 to celebrate the most beloved animation movies characters of all time, including Mickey Mouse - one of the most famous cartoon characters in the world. This year to commemorate Year of the Dog - the eleventh animal in the Chinese zodiac, the New Zealand Mint released a licensed Lunar Disney coin. 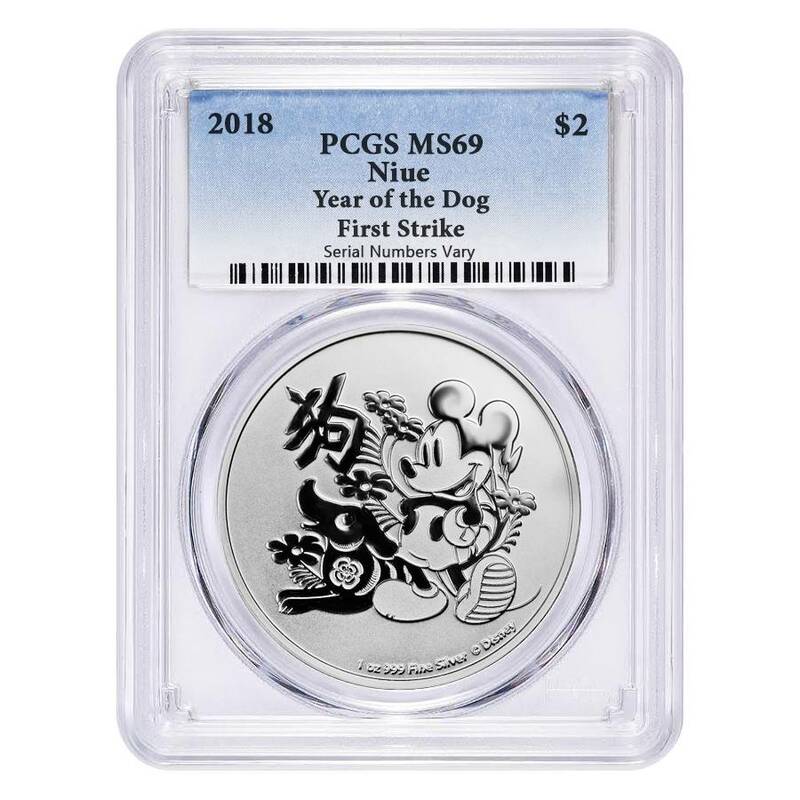 The coin’s reverse features an adorable depiction of Mickey Mouse accompanied by an artistic rendition of a lovely dog. The design also includes the Chinese symbol for ‘dog’ above the dog’s caricature. The coin’s obverse depicts the effigy of Her Majesty Queen Elizabeth II, also date and coin’s face value. Each coin is stamped with the Disney copyright for authenticity. The coin was certified by PCGS as Mint State 69 within the first 30 days after official release, that means virtually fully struck coin with minuscule imperfections visible upon close inspection. Produced by the New Zealand Mint. Coin face value - $2 NZD. Official legal tender of New Zealand. Coin mintage - maximum of 10,000. 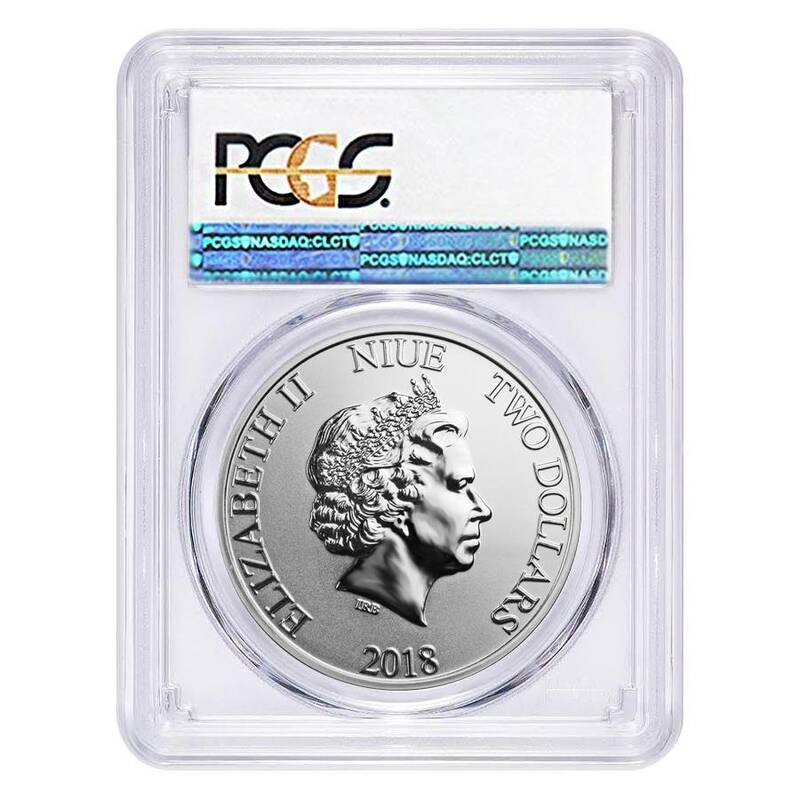 Coin comes sold in PCGS holder with First Strike label. PCGS MS 69 - Virtually fully struck coin with minuscule imperfections visible upon close inspection. 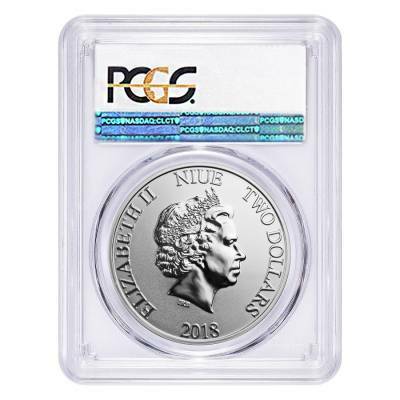 Obverse: Depicts the portrait of Queen Elizabeth II, Inscriptions: “2018”, “2 Dollars”, “Niue”, “Elizabeth II”. Reverse: Features an adorable Mickey Mouse image with a stylized dog, surrounded by flowers and the Chinese character for Dog. Inscriptions: “1 oz”, “.999 Fine Silver”. At Bullion Exchanges, you will find an exceptional selection of exclusive bullion pieces from the most prestigious international refineries. If you have any questions, just call us at 800.852.6884, or send us a message, and our customer service representatives will be happy to assist you. Classic and unique at the same time, love it! Very cool new coin! Adds something unique to my collection. Great new design, as a Disney fan you can't beat this one! Very excited to be able to order this graded version! This is such a great coin!